This new recording presents two masterpieces of the German song repertoire: complete recordings of Hugo Wolf's Spanish & Italian Songbooks-- in all 82 songs. The three-CD set features highly regarded singers and pianists from Germany, Austria and the USA under the artistic leadership of the eminent baritone, Wolfgang Holzmair. Complete texts in German, with English translations included. 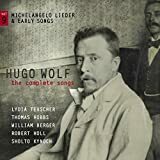 Stone Records is delighted to announce its newest Oxford Lieder Live release, the second disc in the first ever complete edition of the songs of Hugo Wolf (1860-1903). The disc, recorded live at the 2010 Festival to commemorate the 150th anniversary of the composer s birth, completes Wolf s famous Mörike songbook, and includes some of his best known Lieder. Over the course of the next couple of years, Oxford Lieder is promoting a series of concerts encompassing every song, all of which will be recorded and released on the Stone Records label, in a series of around a dozen discs. The Mörike Lieder was chosen as the ideal starting point because it includes many of Wolf s finest creations, and represents a perfect marriage of poet and composer. The four singers on this first disc are internationally renowned Lieder singers and, together with the festival s artistic director at the piano, provide world-class interpretations of these exceptional songs. They were recorded in the Holywell Music Room, Europe s oldest purpose-built concert hall, by the multi-award-winning production team of Mark Brown and Julian Millard. In addition, the disc s booklet features translations and detailed notes by Richard Stokes, a leading authority on the interpretation of Lieder.